In this article we will show the 5 Settings that should be done to get your chrome run faster if it has gone slower than before. Google chrome contains real clean and minimal environment that helps you browse faster, safer and easier. But sometimes you may find it getting slow, not as fast as it was when you first installed it. Google Chrome is a real hungry beast. It’s hunger for RAM is never gonna stop. But, if you’re aware – the recent update to version 45 and above has brought a substantial decrease in RAM usage. So, let me show you different settings that you should apply to reduce lag and make chrome fast. Note: The experimental features might affect your browser at some point. Mostly it doesn’t. But, be careful to do just as demonstrated. Well, chrome has a special page of experimental features. These are the features that are still in development and will be applied in future versions. But, chrome gives us ability to enable them. 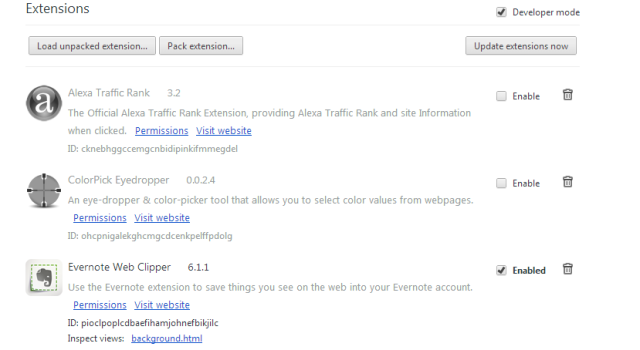 So, not wasting much time go to chrome://flags and enable the features as shown below. Press Ctrl+F and search for num-raster-threads. You should get Number of raster threads feature. Change it’s value to 4 from Default. Search for enable-fast-unload. Enable it. This will make closing of Tabs and windows faster. Search for ignore-gpu-blacklist. It should be at the top. Enable it. This will actually ignore those GPUs that have less Video RAM and performance and let chrome use the available VRAM. Search for enable-smooth-scrolling. Enable it. It does what it says. By default chrome comes with few unnecessary plugins installed. Like Flash, Java and Microsoft silverlight all which should be disabled and used only when they are needed. Because, video and data downloading sites use flash and java. Even some extension make use of plugins. So, that can cause more load on chrome. Our ultimate goal is to provide chrome the space for browsing the web. To disable plugins type ” chrome://plugins ” (without quotes) in the address bar. In there you’ll find all your enabled and disabled plugins. Now just sort out which plugins you don’t need and click on disable. You can keep the flash and java running. But, if you’re a facebook user you’ll have Facebook video calling plugin and VLC web plugin for VLC media player. These plugins are not used often, so, you should disable them. When you press disable the background of that section will turn gray indicating that its disabled. Now, let’s see how you can disable and remove extensions. Extensions are the major thing that causes load on chrome. Chrome extensions are programs that enhances your web experience. By disabling some unnecessary extension can speed up chrome. 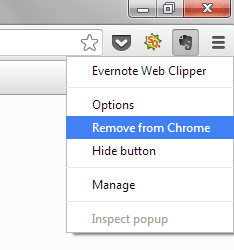 They can be directly uninstalled by right-clicking on the icon and remove from chrome. You can also remove the extension from the settings tab. In the settings tab you’ll get more options like to disable it. Extensions can also be the reason of the “Aw, Snap!” error that crashes chrome. Type ” chrome://extensions “. Here you’ll find all your chrome extensions. You can remove them by clicking on trash icon and if you want to disable it, dis select the enable box. Keeping 2-3 enabled extension will be fine for chrome to run with ease. Every browser has the feature of caching data. The browser stores some of the data that you frequently while browsing. Like login auto-fills for your username, store URLS, text, browsing history and cookies. It’s main purpose is to speed up computer by storing it locally and not to download every time the same content. But, too much of data storing can slow down the browser. So, it’s needed that every month you should clear your browsing data. 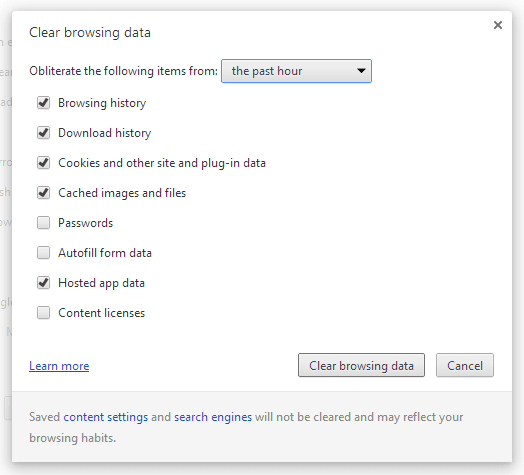 NOTE: Don’t clear your browser data everyday, that can cause your browser to slow down. The main purpose of caching is to increase speed. You can clear it for privacy purposes. To clear browsing data type chrome://history or press CTRL+H. You’ll find a tab saying clear browsing data. Click on it and you’ll get pop up asking you, which things should be cleared. Tick the options that are shown below in the image and select from what time you want to clear the data. If you’ve never cleared select it from the beginning. You may also want to clear only your history by each item. Hover over the link you want to remove and tick the box. After ticking your links, click on the remove selected items tab. Use shortcuts to work faster on chrome. You can navigate quickly and get your work done with these shortcuts. Here’s whole list of shortcuts for chrome provided by Google. On the right of the page you’ll find links for shortcuts on Mac and Linux. Click and clear is a chrome extension that helps you automatically delete your browsing data. 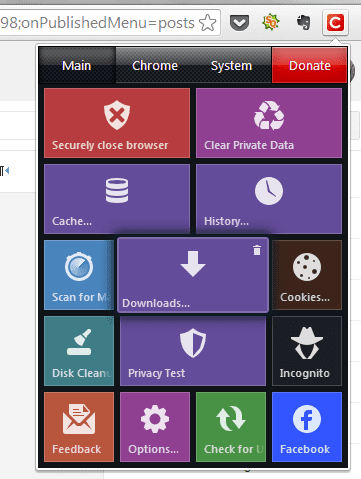 You need to first configure the settings and than just click on the trash icon given on top right corner of each tab. As shown here for the downloads tab. You can refer to the starter guide for configuring the settings. This extension can quickly clear your data within few clicks. 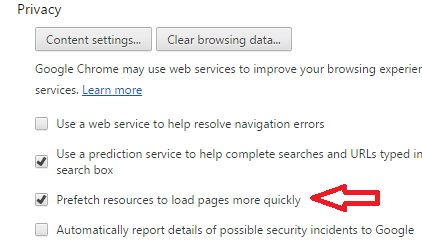 Well these settings will surely speed up your Google chrome browser but that depends on you how you maintain it. We’ll continue with the series of getting things done faster. Stay tuned and do share other tips you have for making chrome run faster.